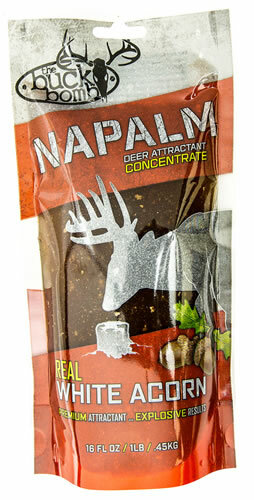 Pique the interest of deer in your area with the explosive flavor of Buck Bomb's Acorn flavored Napalm. The powerful, concentrated attractant packs a heavy punch when it comes to aromas and flavor that deer just can't resist. The convenient sized bag fits perfectly into a pack to carry to a lick site, so you don't have to worry about carrying heavy bags. The Napalm can be poured anywhere, including the ground, browse, decaying matter, logs, grains or other Buck Bomb attractants.